November 20, 2017 (Last Updated: March 9, 2019) - As an Amazon Associate I earn from qualifying purchases. Winter time in Fargo is CRAZY freezing and the winter chill is definitely in the air. Fewer people are outside tending to leaves and lawns, but more are making sure their snow blowers are running. I am not sure when, but that first big snow is definitely on its way. After a long shovel in the middle of Winter, what better way to warm up than with a hot toddy? 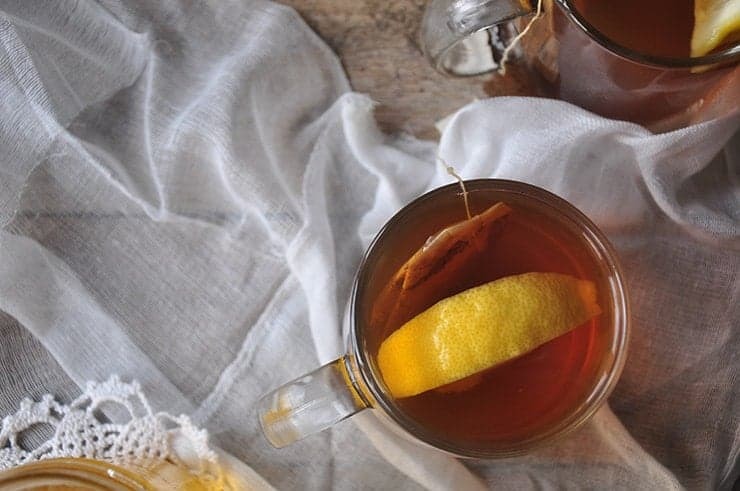 Today, as part of our hot toddy series, we are going to show you how to make a hot toddy. 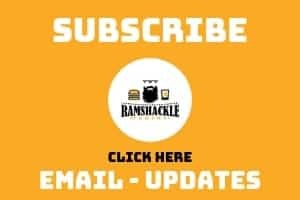 If you are new to Ramshackle Pantry, we are a little bit different than many food blogs. We cover topics for extended periods of time. For example, we have covered Macaroni and Cheese, Manhattans, and Mojitos. We start off with a simple recipe like you will see in this post. Then, we research the topic. We look at the history, the ingredients, and some variations of the drink. At the end of our deep dive, we will make the same dish/cocktail again using our newfound knowledge. The hope is that we gain a deep understanding and appreciation of the topic. Even though this is our first hot toddy recipe, it still is a keeper. 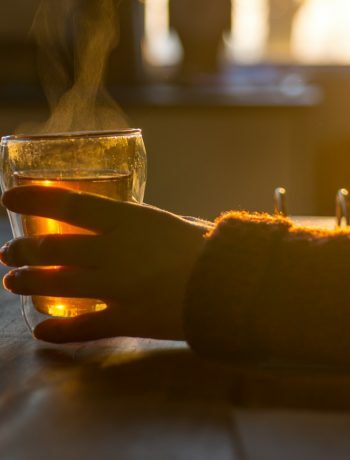 It has all the ingredients that a person needs to warm themselves up on a winter day. Tea, honey, lemons, and whiskey. Pin this recipe now. I was a bartender for several years at a college place and did not make that many of these cocktails, but I did make them on occasion. Rarely enough so that having to look them up in the book sticks in my memory. I am not brand new to the topic, but I still did have to think about my ingredients a bit. I knew it needed a sweetener, some whiskey, hot water and lemon. The only ingredient that was a bit foreign to my memory was tea. I am seeing different variations from around the internet and it looks like most have either tea added or spices added. Since we always have tea around, I thought it would be a good way to use them up. Specifically, I used Yogi India Spice tea. If you like what we are doing here, please follow me on Pinterest and sign up to get my posts via email. How to make a hot toddy. This wintertime cocktail classic is sure to be a fireplace favorite or something just to enjoy before bed. Yes it’s cold here in Alberta, Canada. And already lots of snow. I would definitely like to warm up with a nice hot cup of hot toddy! Plus… it is almost noon, right? PERFECT TIME. I also like the Yogi Teas. There is a Ginger one that I really love. It’s cold here in Chicago! Nothing like a hot toddy to warm up! This is a great recipe that reminds me of my childhood when my parents got sick. I LOVE a hot toddy! I thin I’m going to have to make this tonight. It’s finally cold enough here for them! It really is a great cold weather drink. 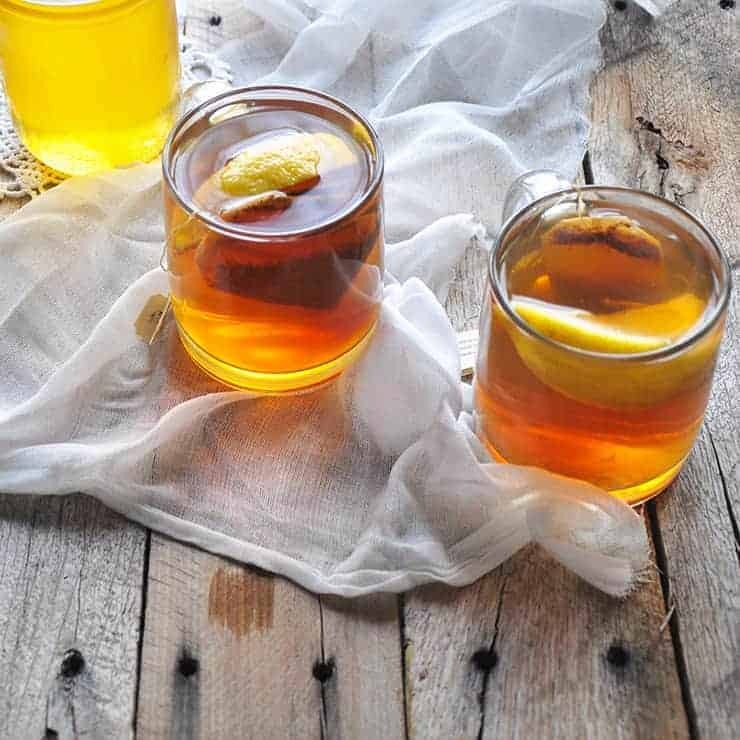 There is nothing better on a cold winter’s evening than a hot toddy…this is perfect! I know it is not winter yet, but we are sure getting there fast! This is the perfect drink for a cold day out. Tea and whiskey, can you got wrong? I love how you keep the tea bags in the cups; it makes for such a beautiful presentation. What a great drink for cold weather! It is just perfect an easy to make. wonderful drink for the winter.Brought back so many memories? Every time I feel a cold coming on a hot toddy does the trick, so good! These helped me with a nasty cold last year! Unfortunately they were so tasty, that I woke up without a cold but a hangover instead. Oops. This is absolutely the best way to use up all those extra tea bags I always have on hand. And so cozy, too. Thanks for the inspiration! What a nice comforting drink that will in perfect in the cold winter months. Your photos are especially pretty! 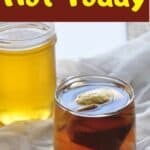 This hot toddy is a perfect drink for a cold weather.. Such a perfect drink for a cold winter day! Love that you left the tea bags in the drinks too! We have a cold and rainy day here today. A perfect weather for hot toddy.! I think I’m gonna make some for us this weekend. So comforting. My father in law makes these for me whenever I’m feeling under the weather. They’re so comforting and amazing for this cold weather! I’ve heard Yogi India Spice tea is delicious, and what a great idea to use it in a Hot Toddy! This is a perfect way to warm up as the weather gets cooler. I love some of the Yogi Teas. We usually have ginger and India Spice hanging around. My niece is always talking about making hot toddies! She loves them!! I cant wait to try your recipe!! That’s interesting. I’ve had hot toddies before, and I don’t think they’ve been made with tea, but what a great idea! I can put whiskey in my tea! 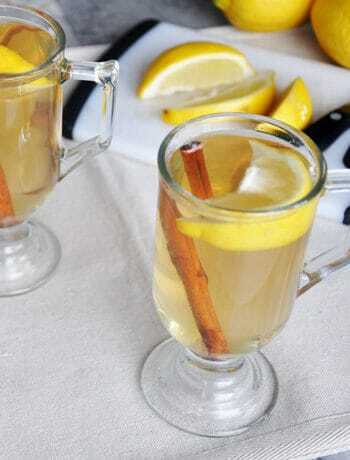 I’ve never made a hot toddy before but this would be perfect for our Holiday party!! The honey sounds so good in there! How interesting that it has tea in it. My husband usually makes ours and I don’t think he uses tea. I’ll have to get him to try that! This hot toddy looks like a perfect drink to keep the cold at bay this winter! Thank you for the recipe.